A girl waits as travelers walk though the security line at O'Hare International Airport. 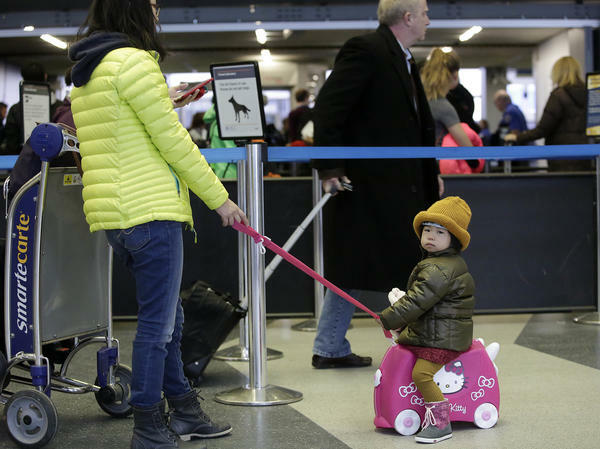 But some industry observers say rebuilding that consumer trust will be difficult because the airlines' harsh conduct in the last couple of weeks may have inadvertently pushed passengers just too far. Let's face it, even before these recent incidents on American Airlines and Delta, in addition to United, air travel had already become a dreadful experience for many of us. "I think it's terrible," said Paul DePaulis of Houston, as he prepares to board a United Airlines flight home at Chicago's O'Hare airport. "We're a bunch of tuna crammed into a can and it's miserable," he said. "I hate it." Still, DePaulis says he has to fly almost every week. "No choice," he said, "business." DePaulis says it's not just United. Most airlines are squeezing more people into smaller seats, restricting carry-ons and making passengers cramped, cranky and craving comfort. On his way back to Philadelphia, business traveler Tim Nelson tried to take it all in stride. "I look at from the standpoint of, I'm gonna get on the plane, I'm gonna get off the plane and don't expect much. Because that way, you aren't disappointed," said Nelson. But Nelson says United's front-line employees do seem nicer since the incident in which a passenger was violently dragged off a plane. Peggy Garrett just arrived from Denver and noticed the same thing. "They tried today; they were very accommodating today," said Garrett. "They seemed to say a couple of things, like 'let us know what we can do to make you more comfortable' and I don't think I've heard that in a while." "I think this is a turning point, I think it is," said Nelly Munoz of Pembroke Pines, Fla. After seeing how quickly United employees responded to her complaints — she and her husband had purchased two seats together but were re-seated several rows apart — Munoz thinks that better customer service is here to stay. "I mean, I noticed it right away that they came in to accommodate us after I made those comments," she said, "so I think they are trying to improve customer service." United and other airlines took a verbal beating in two congressional hearings last week, with lawmakers threatening to mandate significant customer-focused policy changes if the airlines don't improve themselves. "This has to be a turning point for the 87,000 people and professionals here at United," said United CEO Oscar Munoz, as he apologized before the House Transportation Committee last week, "and it is my mission to make sure that we make the changes needed to provide our customers the highest levels of service, of course, but also, a deeper sense of respect and trust and dignity." That may be easier said than done, and not just for United. "It appears that broad-scoped trust in the airlines, that's the kind of trust people have in the industry as a whole, has suffered a big shock over the past month," said Kent Grayson, a marketing professor at Northwestern University's Kellogg School of Management who studies the psychology of consumer trust. He says while recent incidents of passenger mistreatment have gone viral, the more gradual erosion of consumer trust in airlines isn't new. "As a result of airline activities and decision making over really the past maybe even 10 years, customers have slowly but surely started to feel as if airlines don't always have their back," he said. He adds that whether it's true or not, the common perception appears to be that airlines put profit over passenger comfort, and it is that perception that matters most. But Grayson thinks that airline executives now get it and are trying to change that perception. After another viral incident in which Delta removed a family from a flight, the airline canceled a media day that was scheduled for this week after, writing on its website that "the timing is not right to showcase Delta's product innovations and global strategy." Veteran aviation industry journalist Benét Wilson, who blogs about air travel at AviationQueen.com, notes that airlines had already begun to invest in service improvements even before this latest round of airline shaming. "What this incident did was kind of serve as a catalyst and a wake up call to the airlines saying you need to continue to swing the pendulum in the direction of just an overall better passenger experience." Wilson says a big test for the airlines is coming up soon with the busy summer travel season. You can be sure that many of those being packed onto planes will have their cell phones out and ready to record any stumble the airlines make in their effort to increase passenger comfort while still protecting profits. Commercial airlines have gotten themselves into some tough PR challenges recently. Cellphone videos have captured some intense standoffs between airline employees and passengers. Some industry observers say rebuilding consumer trust will be tough because the airlines have just pushed passengers too far. From Chicago, NPR's David Schaper reports. DAVID SCHAPER, BYLINE: As he prepares to board a United Airlines flight home to Houston at Chicago's O'Hare Airport, Paul DePaulis is bracing for an experience he expects to be terrible. PAUL DEPAULIS: We're a bunch of tuna crammed into a can, and it's miserable. I hate it. SCHAPER: DePaulis says it's not just United. Most airlines are squeezing more people into smaller seats, restricting carry-ons and making passengers cramped, cranky and craving comfort. On his way back to Philadelphia, business traveler Tim Nelson tries to take it all in stride. TIM NELSON: I look at it from the standpoint - I'm going to get on the plane. I'm going to get off the plane, and don't expect much. If you look at it that way, you aren't disappointed. SCHAPER: But Nelson says United's frontline employees do seem nicer now since the incident where a passenger was violently dragged off a plane. Peggy Garrett just arrived from Denver and noticed the same thing. PEGGY GARRETT: They tried today. They were very accommodating today. NELLY MUNOZ: I think this is a turning point. I think it is. SCHAPER: Nelly Munoz of Pembroke Pines, Fla., hopes that this better customer service is here to stay, noting the immediate response she got after complaining that she and her husband, who bought tickets together, were reseated rows apart. N. MUNOZ: I mean, I noticed it right away. They came in right away to try to accommodate us. So I think they are trying. SCHAPER: United and other airlines took a verbal beating in two congressional hearings last week, with lawmakers threatening to mandate significant customer-focused policy changes if the airlines don't improve themselves. United CEO Oscar Munoz offered this mea culpa. OSCAR MUNOZ: This has to be a turning point for the 87,000 people and professionals here at United. And it is my mission to make sure that we make the changes needed to provide our customers with the highest levels of service, of course, but also a deeper sense of respect and trust and dignity. SCHAPER: But that may be easier said than done, and not just for United. KENT GRAYSON: It appears that broad-scope trust in the airlines - that's the kind of trust that people have in the industry as a whole - has suffered a big shock over the past month. SCHAPER: Kent Grayson is a marketing professor at Northwestern University who studies consumer psychology. He says while recent incidents of passenger mistreatment have gone viral, the more gradual erosion of customer trust in airlines isn't new. GRAYSON: As a result of airline activities and decision-making over really the past maybe even 10 years, customers have slowly but surely started to feel as if airlines don't always have their back. SCHAPER: He says whether true or not, the common perception appears to be that airlines put profit over passenger comfort. But Grayson thinks that airline executives now get it and are trying to change that perception. Veteran aviation industry journalist Benet Wilson blogs about air travel at aviationqueen.com. And she notes that airlines had already begun to invest in service improvements even before this latest round of airline shaming. BENET WILSON: What this incident did was kind of serve as a catalyst and a wake-up call to the airlines saying, you need to continue to swing the pendulum in the direction of just an overall better passenger experience. SCHAPER: A big test is coming up soon with the busy summer travel season. And you can be sure that many of those being packed onto planes will have their cellphones out and ready to record any stumble that the airlines make in their effort to increase passenger comfort while still protecting profits. David Schaper, NPR News, Chicago. (SOUNDBITE OF MASSIVE ATTACK SONG, "ATLAS AIR") Transcript provided by NPR, Copyright NPR.